These findings, published in the September 1 issue of Clinical Infectious Diseases, indicate that strategies to improve earlier HIV testing among Latinos—particularly in new settlement areas like North Carolina—are needed. Latinos have become the largest immigrant group in the United States and now represent the fastest grouping minority group, making up one sixth of the U.S. population. While immigration from Latin-American countries is hardly new, many Latinos are bypassing border states, such as California, Arizona or Texas, and major metropolitan areas, such as New York and Chicago, for smaller cities and towns in the Midwest and the Southeast, where expanding economic opportunities await. Between 1990 and 2000, the Mexican immigrant population in the Southern states grew more than 300 percent, according to a 2005 report released by the Pew Hispanic Center in Washington. Yet despite their growing numbers, Latinos have less education and English language proficiency and frequently lack health insurance. What’s more, many Latino immigrants are undocumented and thus further marginalized from the health care system. These disparities are evident in the HIV/AIDS epidemic among Latinosin the United States. The U.S. Centers for Disease Control and Prevention estimates that the rate of HIV infection among Latinos is 2.5 times that of whites and that they tend to be diagnosed late, with lower CD4 cell counts, higher viral loads, more AIDS-defining opportunistic infections and longer hospital stays than whites. Ann Dennis, MD, MS, of the University of North Carolina at Chapel Hill and her colleagues document some of the challenges in providing care for Latinos living with HIV in North Carolina, a state that has experienced a recent and rapid increase in the Latino population. 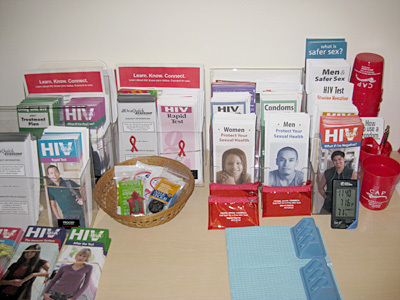 Between 1999 and 2009, 853 patients began HIV care through the University of North Carolina Center for AIDS Research Clinical Cohort. Sixty-one percent were Black, 28 percent were white, and 11 percent were Latino. Though Latinos were clearly a small minority in the cohort, they tended to enter care with more advanced HIV infection, including presenting with an AIDS-defining condition at diagnosis. Average initial CD4 counts were lower for Latino patients (186 cells) than white patients (292 cells) and Black patients (302 cells). Latinos also accounted for 86, 75 and 50 percent of all presenting cases of active tuberculosis, histoplasmosis and toxoplasmosis, respectively. In a statistical analysis performed by the researchers, Latinos were 1.29 times more likely to present to care late than whites or Blacks. Interestingly, late presentation was significant only for Latino men but not for women, likely because women receive a diagnosis at the time of pregnancy. Though the study did not document the country of origin or immigration status of the patients, an accompanying editorial by Carlos Del Rio, MD, of Emory University’s Rollins School of Public Health in Atlanta assumed that most were Mexican and undocumented.